UNC communications professor Michael Waltman explains why hate speech is prominent in 2016 politics. 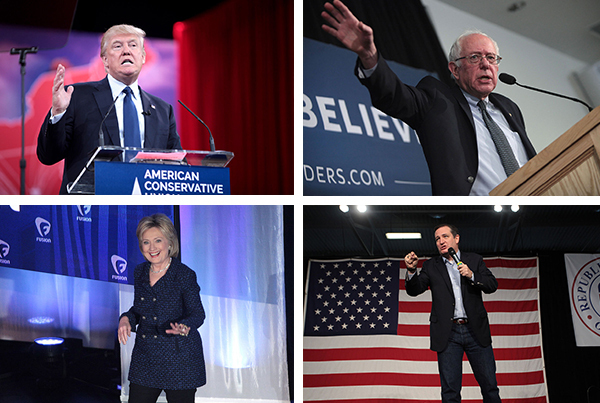 Candidates for the 2016 presidential election from left to right: Donald Trump (top), Hillary Clinton (bottom), Bernie Sanders (top), and Ted Cruz (bottom). Growing up in small-town Arkansas during the heat of the Civil Rights movement can have an effect on a young boy. This was the case for Michael Waltman, whose father created court-ordered desegregation programs for schools. Waltman, a communications professor at UNC-Chapel Hill, remembers his father telling him a story about his colleague’s daughter. The girl was standing outside of her school, which had recently begun bussing, when the boy next to her was shot and killed. “That was the first time that hatred touched my circle of friends in a violent way,” Waltman says. Waltman has dedicated his career to the study of hate speech. He investigates how this kind of language promotes things like hate crime or white privilege. Waltman’s more recent research focuses on hate speech produced by the right wing. “I don’t mean to suggest that hatred is a form of discourse that is unique to the right,” Waltman says. “These hate groups in the United States are at the most extreme end of the spectrum.” Such far right individuals often refer to themselves as white nationalists. In his book, “Hate on the Right,” Waltman analyzes texts written by conservative hate groups who wanted to further their ideology. One of the many texts he examined was “White Apocalypse,” written by Kyle Bristow, who first gained notoriety for inviting white nationalists to speak on his campus at Michigan State University. The novel describes a trios’ attempt to prove that the original people of the United States were white. In order to understand how hate forms a lens for right wing groups and their views on politics, Waltman examined other books tied to the Christian right, parliamentary right, and racist right. He recognizes that most modern hate groups, however, communicate and recruit online. “There was a time when a gathering of white supremacists might require traveling long distances to a compound in an isolated location,” Waltman says. “But in the 1990s, for the cost of an inexpensive computer and modem, these people could connect and share their ideas.” Not only did the Internet make hate groups more accessible — it made them anonymous as well. This anonymity allowed hate groups to organize without leaders. Web pages popped up offering books, cartoons, newspapers, chat rooms, and any other form of hate speech that a user may want to access. Anonymity was the missing gear in the machine — and once snapped into place it allowed for hate group membership to grow exponentially. As these groups grew, members developed more freedom in their overall mission — with every resource at their fingertips, these individuals could pick and choose what they wanted to believe. “Even before Trump began to vilify Muslims, the basic beliefs found within organized hate groups were becoming a part of mainstream social and political discourse,” Waltman says. The pervasiveness of hate speech in the election cycle is becoming increasingly dangerous, he adds. History shows that hate speech and violence go hand-in-hand. Reflecting back on examples like David Duke — the former Grand Wizard of the Klu Klux Klan — an obvious pattern of rhetoric creates prejudice that inflicts physical or psychological injury. This particular type of violence is referred to as ethnoviolence, and Waltman believes it is still present today. Donald Trump exemplifies this kind of hateful rhetoric, according to Waltman. Trump kicked off his campaign by constructing undocumented Mexicans as rapists and criminals, and continues to spout hatred by portraying Muslims as a threat to the United States. These statements could lead to violence against the minority groups targeted, Waltman explains. While no one can pin down who the “Trump voter” is, there is still concern for how these individuals will act when it comes time to vote. Because it’s still early in the election cycle, measuring the influence of hate speech on voters is difficult — although, it’s becoming more common in our everyday lives, according to Waltman. Michael Waltman is an associate professor in the Department of Communication at UNC-Chapel Hill. His focus is in interpersonal and organizational communication. This entry was posted in Creativity, Invention, Society. Bookmark the permalink.